Yay! I love fantasy again!! !Yet, I still hate reviewing fantasy - with an added emphasis on the word hate. Most books = Point A to point b. Fantasy books = Point A intersects with person C on the way to meeting person F at point Y. How the heck do you review that?I'll reiterate what I've loved about Seven Realms so far. These books meet the criteria for what I'd like to see more of in YA fantasy. There is action and adventure. There are plenty of varied characters from all walks of life. There is an element of romance without it choking out the rest of the story. The books will appeal to a broad base of readers, even lovers of adult fantasy. Nothing here feels dumbed down or excessively youthful. In fact, I'd say these books are more mature than a good portion of the adult crap I've read lately. No joke. 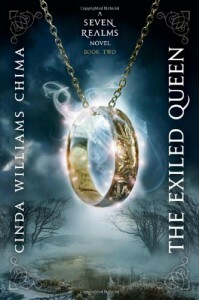 Whether you're new to fantasy or it's an old love, I'd say this series is worth checking out. It has a little bit of something for everyone.I might add more later, but maybe not. Fantasy still owns my ability to review, apparently.